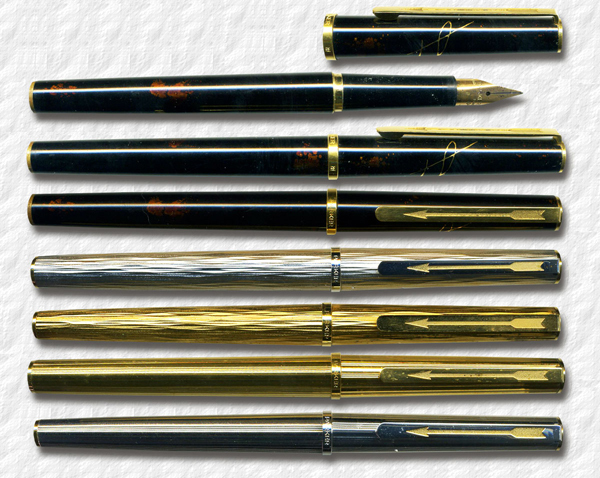 n late 1978 Parker in France launched a new high end pen, loosely built around the Parker 75 nib, the Parker 85 Elegance. But while the nib unit was similiar, the gripping section was smooth, lacking the ribbed features of the Parker 75. The most distinct feature was however a new clip. It was rectangular, with a rounded end and had a stylized version of the Parker arrow engraved on it, and was held down by a flat metal clip screw. The fountain pen was 140 millimeters long and had a slightly raised band portruding from the cap lip with the engraving Parker on it, somewhat similiar to the later Premier. The cap also had the hallmark of Parker France. The model was offered as a fountain pen and ball pen and came in four finishes only. he Acacia was an attractive bark finish and the Florence design had vertical lines. The Parker 85 never really caught the public eye, some say that it was unevenly balanced, being somewhat top heavy, and it was discontinued in late 1982. It was replaced by the Parker Premiere (mk II). The Parker 85 is quite rare, especially in the US, and is very sought for by collectors. Images © and courtesy of Tsachi Mitsenmacher.